Another cool Marvel movie, this one is like Inception meets the Matrix, with it’s take on exploring new worlds and dimensions with a whole new set of rules. Once again Marvel proves that they are the studio to beat. Superhero movies are the hottest ticket in town, and Marvel is the studio that consistently does them right. With this film, the characters explore sorcerey and mysticism. But instead of being about potions or spells, this movie is more about power and dimensions. It’s the right move to get us to take the subject seriously, and getting horror director Scott Derickson to direct certainly didn’t hurt either. The story is pretty good, but the visuals and action scenes are spectacular. 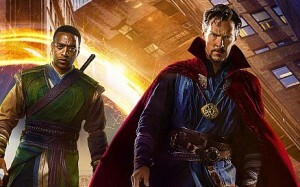 Doctor Strange is a new kind of entry in the cannon of films that make up the Marvel Cinemstic Universe. It’s amazing how one studio can just keep turning out hit after hit, and have nearly every one of the movies be pretty good. The trick seems to be to keep the atmosphere colorful (something that the DC movie world refuses to do,) throw in humor whenever possible, and keep trying something new. Doctor Strange is certainly that. It enters all kinds of trippy, wild worlds, the likes of which we have never really seen before. It also has the usual Marvel staples of a cool origin story, strong characters, and some great action. If you want to compare this movie to things we’ve experienced in the past, there’s some Inception in here, (the folding buildings, the out of body experience,) and also some Matrix, (the new world with new laws and possibilities.) But this movie is different, because unlike those other films that do it from a Sci-fi angle, this movie does it through magic and sorcerey. Now that’s a pretty tough thing to get right. It’s one thing to go all Star Wars with outer space and planets and aliens, the way that Guardiens of the Galaxy did, but magic is a whole other ballgame. It’s one of the hardest things to make believable on screen or to get audiences to take seriously. And yet, this movie does pull it off. The path starts with Strange getting into a car accident that destroys his hands. Before the accident, he was one of the greatest surgeons around. Afterward, he can no longer work. And then a physical therapist tells him the story of a man who was once paralyzed from the waist down and willed himself into recovery. Strange goes to find this man, (played by Benjamin Bratt,) and to learn of his story. 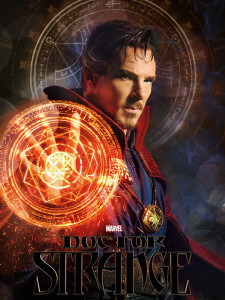 The second thing the movie does, is it lets Strange enter the world and get the hang of the magic, slowly. There’s a tool that he needs to be holding, (which looks like a pair of brass knuckles,) and then a certain way he needs to be holding his other hand and making circles with it, in order to open up portals. We watch Strange taking classes about this and failing miserably. The third thing this movie does, which helps captivate the viewer, is it gives Strange a real reason to pursue this new world. In some ways this is like Batman Begins, with the character traveling to the war reaches of East Asia to learn some ancient wisdom. Only a major difference is that here, Strange has real motivation. His hands no longer work, which means he can no longer do what he does and what he loves. And the movie takes the time to get Strange there, first having him seek out Bratt and follow the clues. Like most Marvel movies, the characters and humor here are both pretty strong and entertaining. Strange is met in the east by a man named Mordo (Chiwetel Ejiofor,) who brings him into the temple to meet Thr Ancient One (Tilda Swinton.) And each of these characters has a deep secret or major arc ahead of them. Nothing is simple here. Even the villain, Caesilius, makes a claim against the Ancient One that might actually have some legitimacy behind it. Nothing is black or white in this movie, and existing in that grey area is a pretty cool place to be. Anf then there’s the action, and it definitely does not disappoint. There is an opening fight on the side of s building while pieces of the building continually unfold and move around. It is incredible. And this is the movie just getting started. There are three different sanctorums or sorcerer hideouts, and there’s an action scene in or around pretty much every one. And the sequence where Strange first discovers the crazy possibilities of this world is up there will some of the trip purest dream / hallucination sequences of all time. Let’s just say the fingers bit is equal parts creepy and cool. Dr Strange is another Marvel success story. It’s not fantastic the way some of the Marvel films have been, (Gaurdians, The Winter Soldier,) but it certainly has a lot to offer. There are certainly area they could have been stronger, including the humor and the love interest. The movie is crowded with a few too many characters, and as a result, some of them are just not given enough time. Caesilius, the villain, for example, is pretty cool, but could gave also been a whole lot cooler if we only got to spend s little more time with him and understand his motivations better. But these are minor flaws in a movie that does nearly everything right. And you have to applaud the movie for going all out during its climax, not restricting the movie to this would, but allowing to travel into new stratospheres. This movie isn’t afraid of going too far or of giving us too much. That kind of energy, ambition, and enthusiasm is certainly appreciated.